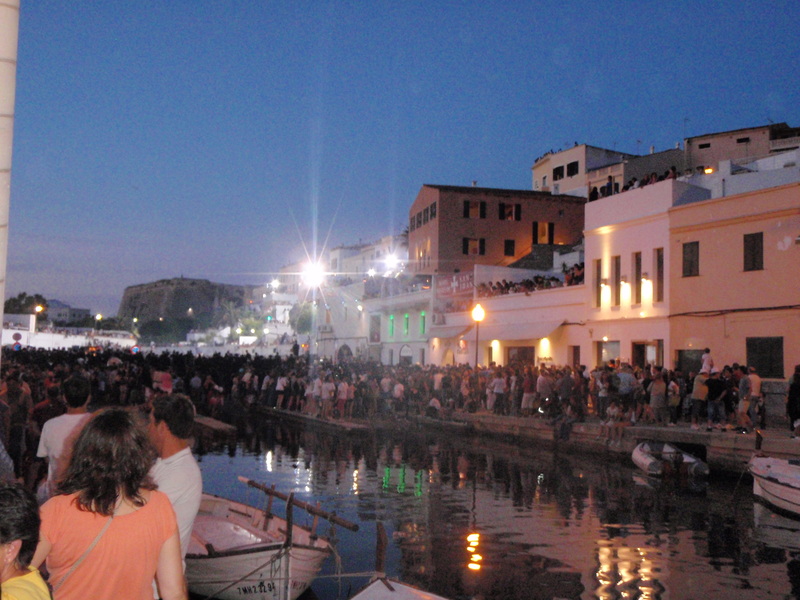 Menorca is a real jewel in the Mediterranean sea, with something to offer everyone. The island offers a perfect climate, over 200 stunning beaches, and a taste of real Spain. There are historical sites to visit, underwater treasures to dive into, virgin beaches to explore, along with all the resort facilities you need to make a perfect family holiday in Menorca. It’s the second largest of the Balearic islands, and is still relatively unspoilt compared to other med destinations. The entire island is a European Biological Reserve, and also a Unesco Biosphere Reserve. Mahon is the capital of Menorca, and is in the south of the island. Menorca airport is located just outside of Mahon (spelt as Maó locally) The city has the second largest natural deep water port in the world. You can also explore the narrow streets and bustling shopping areas, or watch the world go by in one of the squares or pavement cafes. 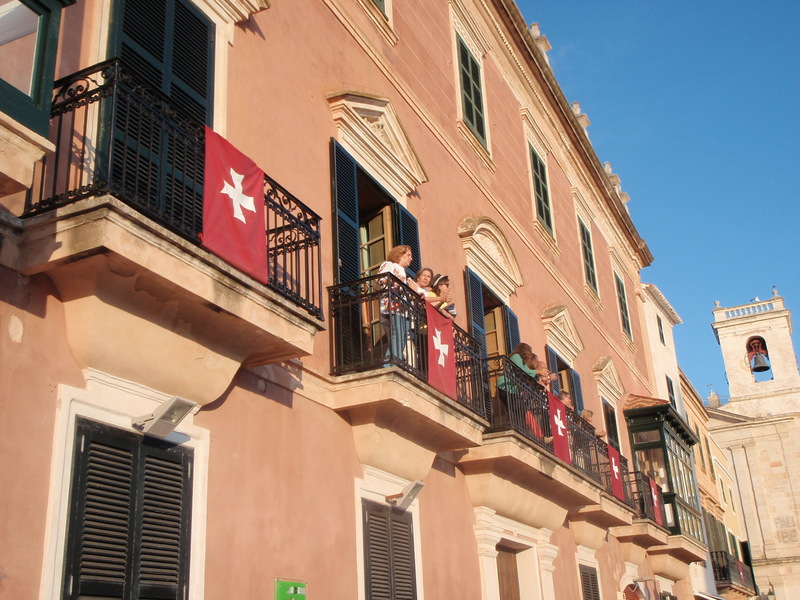 On the west of the island is the old Capital of Ciutadella, a must see during your stay. Steeped in history and stunning architecture you get a real flavour of Spain. Winding cobbled side streets are lined with boutiques and pavement cafes, and the port area has some fantastic waterfront seafood restaurants. 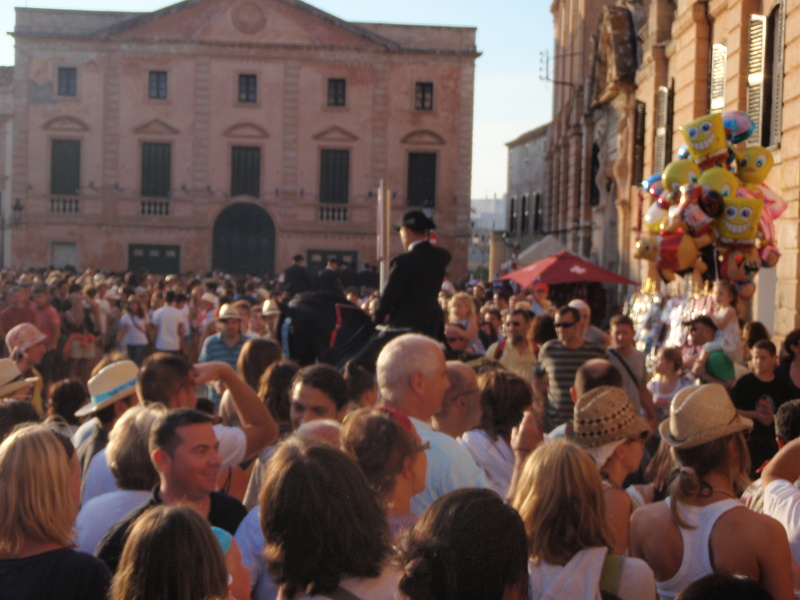 Buses run regularly from the west coast resorts into Ciutadella for just a couple of euros. 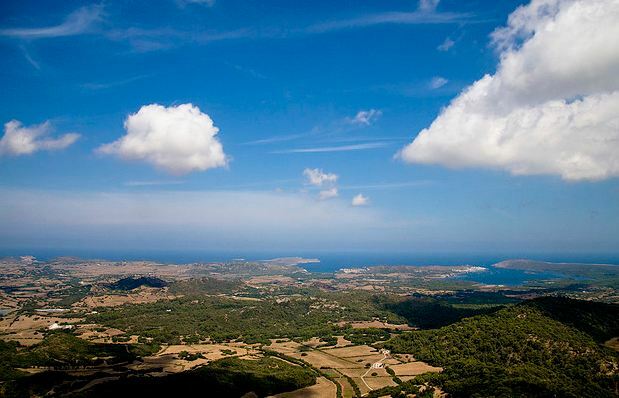 Monte Toro is the highest point on the island, standing at 358m above sea level. It’s in the centre of the island and can be accessed by a steep winding road with breathtaking views on the way up and magnificent panoramic views of the island from the top. There’s a 17th century monastery there, plus a gift shop and cafe. The currency in Menorca is Euros, and you can check the current exchange rates here. The flying time to Menorca airport is usually just over 2 hours from most UK airports -another good reason to visit! 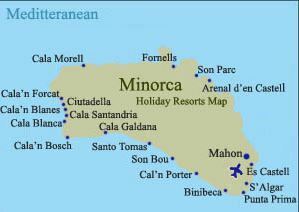 You can see more details about which airlines fly into Menorca airport on the links page. It’s very easy to get around by public bus. Timetables are printed at the bus stops, and in the local daily papers. Buses tend to be inexpensive, run regularly, are clean, and air conditioned. Buses run between Mahon and Ciutadella, and from Ciutadella to most of the west coast resorts -Calan Bosch, Calan Blanes, Calan Forcat, Cala Blanca, and Santandria. Remember that a lot of buses will have a break at siesta time so check the times carefully. It’s also very easy to drive in Menorca as the roads are quieter and there’s really only one main road running from top to bottom of the island. You can drive top to bottom in about 50 minutes, and East to West in about an hour, but you can take many more hours exploring the hidden coves and pretty little towns! Remember to keep your car hire documents and driving licence with you at all times, drive on the right, and ensure children sit in the back at all times. You can get quotes for car hire via the links page. Taxis are available outside Menorca airport and are supposed to work on a fixed fare system so you should always ask for a price before you get in. It’s also possible to pre-book taxis in advance of your arrival using one of the companies listed on the links page. There are taxi ranks situated in all the main resorts and are marked by a blue sign with letter T on it. Another option for getting to and from the airport is to use a shutter transfer service. Lots of previous guests have found these to be the cheapest way, and generally no problem to use. You can see links to the companies that offer this service on the links page. The two main towns for shopping are Mahon and Ciutadella, both have numerous boutiques and independent retailers, as well as a few larger stores. There’s a market in Mahon on Tuesday and Saturday, and in Ciutadella on Friday and Saturday, plus a daily food market in Ciutadella. The island is known for it’s production of cheese, leather goods, and gin. All of the resorts featured have a selection of shops and supermarkets for your holiday essentials, all within walking distance of the villas. A must see if your stay coincides with any of the islands fiestas! There’s one fiesta each month in a different town each time. 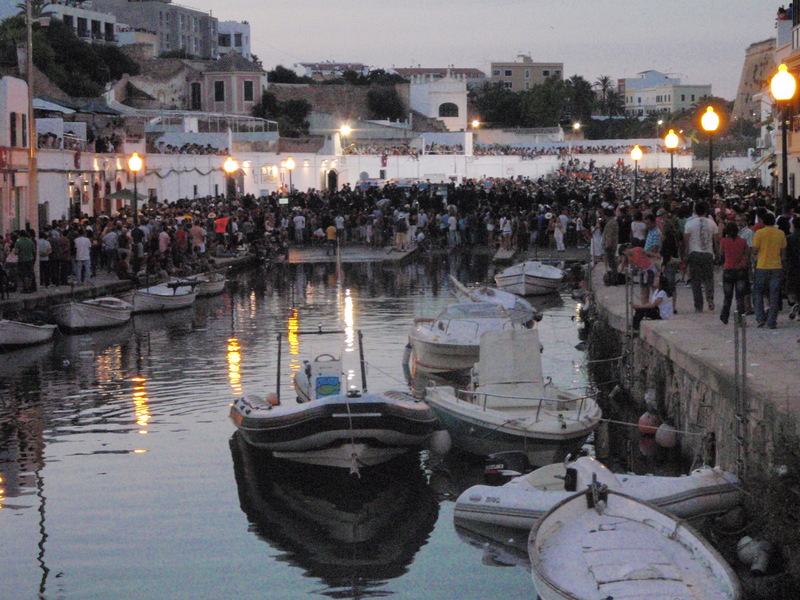 The best by far is San Joan which is around the 24th June and goes on for 3-4 days, it takes place in Ciutadella. It’s steeped in tradition and history, dating back to the 14th century, and the whole town turns out to join in with the various traditions and celebrations. You’ll see the braver of the locals running in front of reared up black menorquina horses to touch their heart for good luck, and you’ll see the riders competing in mounted jousting games along the port side. The whole town comes alive in a blaze of music, fun, and celebration. Absolutely not to be missed if you visit at the end of June!